What’s up in Chiang Mai new condo? The Chiang Mai new condo represents the future in condo design with its inclusive amenities, stunning views, and luxurious accommodations. The New Concept Condo Boutique, Touch Hill Place Condominiums, and The Scene Condos located in Chiang Mai offer resort style living for those searching to live a life of luxury and leisure. Below, we’ll review all three-condominium complexes so that buyers can weight the features, pros, and cons of each location to make an educated decision. Continue reading and find your next dream house today! When completed this condo complex will be conveniently located so that owners can easily and quickly reach anywhere in Chiang Mai. Furthermore, the grounds are surrounded with tall trees for privacy and beautiful flowers to create a peaceful and relaxing experience. Buyers will instantly fall in love with the calming aura of the grounds and the resort-like beauty surrounding them. The complex will have a total of 209 units and has a starting price of 1.34 Million Baht. Purchasers of a condo in this complex receive access to the club house that includes a restaurant serving five star quality food, a full-service gym, on-site masseuse, and friendly concierge service at the front desk. With available room service, condo owners will not even have to leave their homes to eat a meal. Construction has begun on the three building project; however, only the first building has been fully constructed. Are you searching for the ultimate condo with luxurious finishes and resort-like amenities? If yes, the Touch Hill Place 67-unit condo facility is luxury like you have never experienced. With prices starting at 3.13 Million Baht buyers can expect sound-deadening walls, beautifully landscaped grounds, and amenities found only in the world’s best hotels and resorts. Condo owners receive 24/7 access to the fitness and sauna rooms that utilize the best equipment available. Swimmers will enjoy the large pool that includes a smaller pool and playground area specifically designed for children. With 24/7 security and CCTV monitoring, buyers can rest easy that their valuables and family are safe and secure. The construction of the building has not yet been completed; however, condos are available for pre-order and purchase. A total of 67-units are available ranging in size from 1-5 bedrooms and 69.50-302.38 square meters. The standard features of each room include engineered wood floors, double brick walls, smart television system, air conditioning. Buyers searching for a peaceful oasis and condo designed on the Zen concept of balance between nature and humanity will love the design plans for this yet to be constructed complex. The facility is designed to blend in with the earth’s natural surroundings to create magnificent views of Chiang Mai’s aesthetic beauty. Price for a studio condo begin at 1,064,000 Million Baht and rise to 10,756,800 for the top floor penthouse condo. There are 162 units total in the complex ranging in size from studios at 32 sq. m. to 2 bedrooms at 200 sq. m. No matter the condo chosen, buyers will not have to sacrifice luxury or amenities as the condominiums are to be built with the best materials. Currently, the development company is waiting for EIA approval of their design before construction of the buildings can begin. However, interested parties can visit the sales office and tour the sample room. Designed to bring the outside in inside, each condo includes large floor to ceiling windows that offer a panoramic view of Chiang Mai’s beauty. Additionally, the earth tones continue throughout each condominium to create a peaceful living space for each occupant. When not in your apartment, condo owners can relax in the majestic pool or workout in the fitness facility overlooking the grounds of the complex. 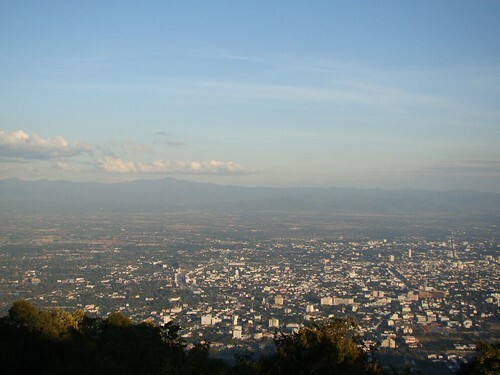 With these three options finding a Chiang Mai new condo will be easy for any buyer. Prospective owners cannot go wrong with these options as all three combine to offer resort like amenities, manicured landscapes, and beautiful condominiums. Furthermore, with offerings available at a multitude of prices, buyers can have their choice of condos. The construction on most of the condominiums has not begun or is still ongoing; however, buyers are encouraged to contact the developer to discuss purchase options and anticipated completion dates. If you need to have a short stay in Chiang Mai check the hotel here.